We don't dye eggs any more *sigh* Wish we could! Have happy easter or passover! This easter we're going to be in the Grand Canyon. [Insert tragic sigh here] No eggs for us. I'm more of a chocolate decorating person. i made an ax out of chocolate to complement my easter bunny with a eye halfway down its face. Oh, yeah, I'd forgotten about Kirsten's egg issues. Huh. @Dakota: What do you mean, Easter eggs aren't edible? My dad ends up eating ours every year. 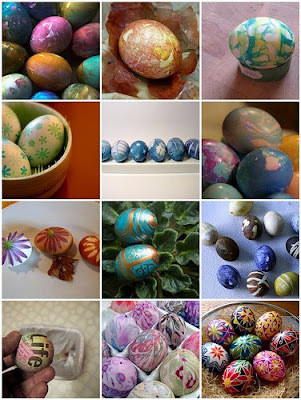 Those egg designs look impossible, the most decoration I've ever put on an egg is white stripes with a wax crayon. And what do you guys think of an Easter Cupacabra instead of a bunny? international mastermind: lucky you. all we do in spanish is... nothing. If we did that, they would probably fine us for having fun. They would consider it destructive. yawn. They don't think we are capable of being mature and civilized. they might as well be right. I swear, i would've learned more if I just read a spanish dictionary. international Mastermind, your so lucky you have fun in spanish, all we do is sit and read. but when the teacher isn't looking, we make paper airplane planes and we smack each other with rubber bands, right now we are thinking of ways to annoy the teacher and get her fired, she doesn't teach us anything!!! anyone want to help me with ideas???? It's not fair! the younger grades at school get to dye eggs but the older classes didnt get to! lolz, this Ukranian couple comes to the school every other year to do the Ukranian art of Pysanki eggs with us. I always ended up burning myself! lolz. I still have brown vinigar instant PAAS die on my hands - some of my eggs turned out awsome, but I couldn't perfect the ductape. Thanks for linking to the egg post on dabbled.org! ABCS, interesting thought..... but i can't get suspended..... very bad.... still very interesting!